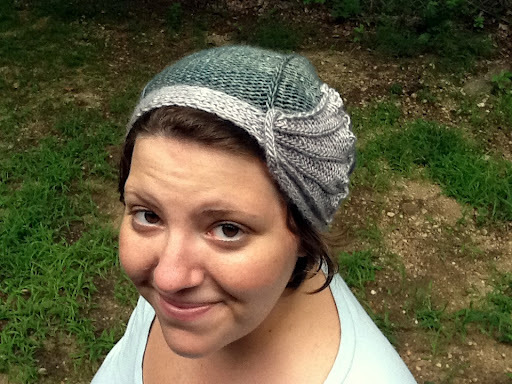 This is my aptly-titled Shiny Slouch project, also known as the Regina hat designed by Carina Spencer. 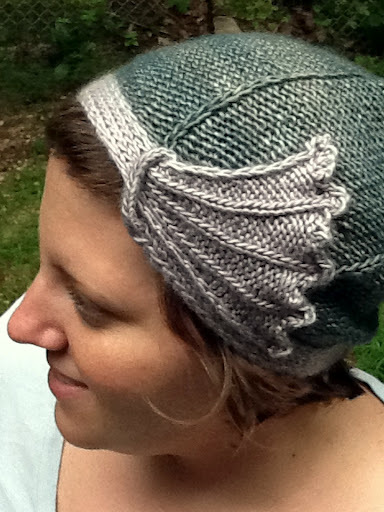 I can say without a doubt that I love everything about this design, the pattern, and the finished hat. The pattern is well-written, detailed, and provides instructions for knitting the hat in different weights of yarn, of which I am a strong supporter and aim to do in my own patterns. The design is also interesting in and of itslef: an unusual brim, simple shaping, and easy knitting that feels like a surprise when you turn the hat inside out at the end. I love the way the slipped stitches look over the reverse stockinette background as well as how they come together neatly at the crown. I appreciate a hat with well-constructed and interesting crown decreases. For my hat I used the The Sanguine Gryphon Codex, which is sadly discontinued. It is a fantastic mix of 52% silk and 48% BFL wool, meaning it has a lovely shine and drape which I highly recommend for this hat. It will be available from The Verdant Gryphon on Monday, August 13th at 9pm. It will likely sell out extremely quickly so I suggest you seriously stalk the yarn if you want it, its fans are many and quite fervent. I used about half a skein for the hat body and just a small amount for the brim, the whole hat weighs 65 grams. I made a few modifications based on how it was knitting up at the time. 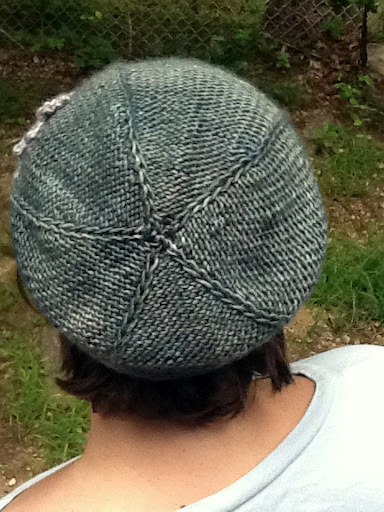 I initially knit my brim to about 17″ and then picked up 60 stitches and increased to 80. I knit for a few inches before I felt the hat wouldn’t be slouchy enough so over a couple of rounds I increased to 90 stitches total. I also knit to about 7.5″ before decreasing. I’m very glad I did this even though I have a pretty average-to-small-sized head. The hat is slightly under-slouchy but the silk still helps it drape nicely and I love the way it looks. Other people on Ravelry have mentioned that it is more like a beanie than it is slouchy, so if you want the slouchy look and are in doubt, increase more and knit longer. Overall: I adore this hat and highly recommend the pattern, which is incredibly offered for free as I would gladly have paid for this one. What’s your favorite hat to knit or wear? Also, don’t forget about the little giveaway I’m running right now for some knitting needles in larger sizes, a couple of mini skeins, and a free pattern. Details in this post. I will pick the winner on Sunday. There aren’t very many entries yet (leave a comment to be entered) so chances are pretty good! Check out more FO’s here! This entry was posted in FO, FOFri, hats, yarnaholic by shoelaceswitcher. Bookmark the permalink. Adorable. I love this one- stylish and different. Great job! I love that hat! It turned out so cute and stylish! The hardest part for me was just tacking the fan part into place, it took me a couple of tries before it looked right. I seriously love this hat, it is adorable, the colours go so well together, and it looks great on you! It's definitely in my queue! Gorgeous! It looks so much better now that's it's being modeled 🙂 Lovely yarn choice! I thought it looked good before, now once finished and being worn, it looks amazing! I really love the design and particularly your color choices, perfect! Now I really want to knit this one! Yay! 🙂 I love spreading good-pattern-love. *shrieks* that Regina hat is A-freakin-MAZING!!!!! haha, thank you! I obviously highly recommend it.